The Expedition version of the TLT7 features a Custom Ready liner that is warmer and takes up more space within the shell. This makes it a better fit for skinny-to-average width and cold feet. All feet will appreciate the toe fittings being moved closer to their natural pivot point. This fact, combined with the Snow-dynamic concept and Speed Nose make the “7” the most efficient climber yet in the TLT series. Turns out the ski down is pretty great too, with a simple fixed tongue system that locks into place with one motion of the new two-in-one UltraLock 3.0 closure system. The TLT7 Expedition is sophisticated enough to be incredibly simple. UltraLock 3.0 controls both buckles and the ski-walk mode switch in one spot. Speed Nose* makes every step more efficient with moved pivots and no toe bail. Lambda frame uses some carbon as a stiffener for both forward and lateral flex. Fixed tongue keeps the snow out, adds stiffness while skiing, yet walks well. Lower closure is micro-adjustable and has no clasp that gets banged on rocks. The shell is light and stiff Grilamid® and the cuff is infused with some carbon. 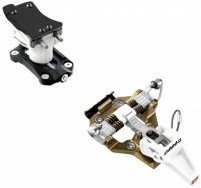 MasterStep fittings are Dynafit's latest, super strong and easy to step-in. Snow-dynamic concept is a unique shape that helps cut drag in snow. Custom Ready liner is warm, moldable, and relatively stink-resistant. Comes with a quick-release power strap installed (not pictured). Bottom Line The climboosting lap master. I love these boots. I've had them for three years. One small issue I have, is that on multi-day trips the wire in the fastening system freezes to the coiled sheath. Has anyone figured out a good fix for this? Is there any difference between men and women models except buckle color? Hi John, not much in the way of differences, but the liner is tweaked for the women (cut slightly lower in the cuff, e.g.). There are a lot of haters on the tlt7 series and I honestly think that they're just behind the times. As a person who climbs Rock and ice in ski boots I do not feel the need for a fully automatic crampon as most of my fast and light boots do not have a toe welt anyway and I've been using semi-automatics for years. In my opinion There is almost 0 difference in speed of attaching crampons between semi-automatic and automatic if the crampon is sized properly. the speed nose concept is brilliant and actually does make a difference, both in walking climbing on rocks and in skinning, it's just science, if you reduce the length of a lever arm then you reduce effort. And the high-volume fit works perfectly for me so much so that I can go down in an entire size which I never thought I would say with Dynafit. I've also seen a lot of reviews about products breaking which is interesting considering that I tour almost daily in mine last week getting 22,000 feet alone of earned turns. including lift service I'm easily over 200000 ft on these with no issues and while I don't huck Cliffs I occasionally like to jump things and I do not baby the boots at all. 0 lower cuff issues zero releases no slop has formed in the cabling nor have I noticed any issues at the cuff pivot. The boot also punches very easily and is easily modifiable without fancy equipment. The people who are having issues either got a bad batch that I have no doubt dynafit would warranty or they are being unnecessarily rough on the latching mechanism. I simply apply a gentle pressure and close it steadily. I suppose if you just ripped on it as hard as you could to throw it back and repeatedly did this that you would introduce unnecessary strain on the cabling. Either way it's a great Boot and I hope dynafit continues to make boots that fit more average feet like these ones do instead of the ridiculously narrow ones of the past I also applaud the innovation. No faffing around while my partners are dropping their tongue inserts or worrying about some other nonsense while I'm already ready for the next lap. 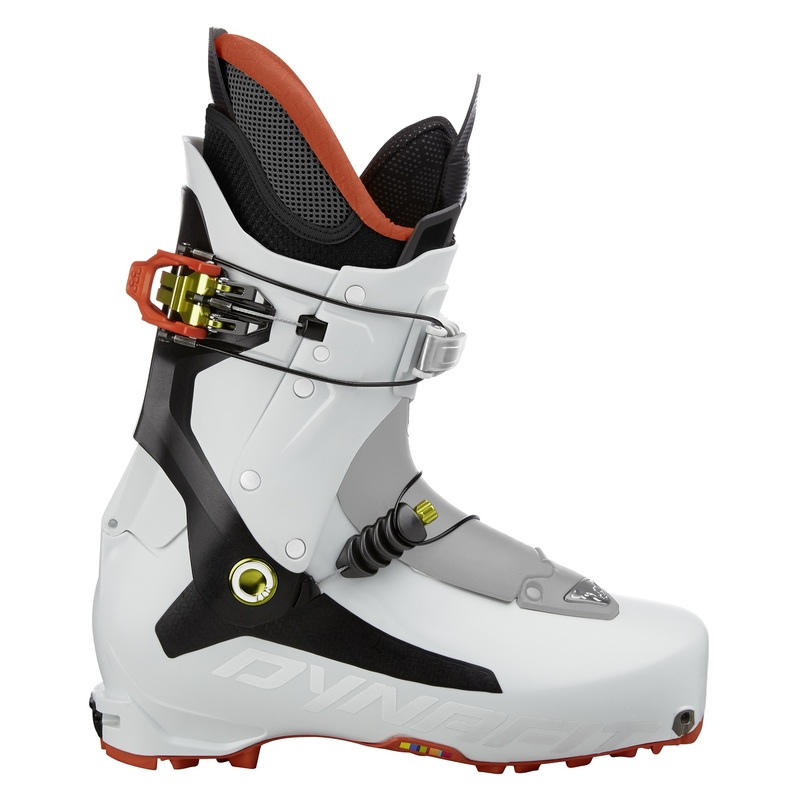 get a pair and try for yourself, obviously the biggest thing with the ski boot is going to be fit but if this boot fits your foot well then I highly recommend it or any of the 7 series. Oh on another note the Rubber Soul holds up extremely well, I literally wear mine for more than half the day most days including running errands driving and going to the grocery store after skiing and all that walking on concrete has literally done nothing to them. Worst boots I've ever owned in 25 years of ski touring. Last year I broke the shells on day 10, the cable on the forefoot buckle on day 12. This year the lower cables freeze up and I can't free them to buckle the boots tighter. Today I broke the required crampon adapter in a bad spot, that made the event rather dangerous. Avoid these boots like the plague that they are. Sorry to be harsh, but they really are just garbage and full of gimmicks. Any updates on the Expedition vs the Performance regarding fit, etc? I'm curious as to whether there are any differences in boots besides the color and different liner? Hi Matt, the fit is different due to the liner. The Expedition has a thicker liner so the boot feels smaller. The Performance has a fairly generous fit, especially by historical Dynafit standards. The other difference is the material in the Lambda frame. There is a bit more stiffness with the Performance shell due to the more rigid Titanex material. It's noticeable but not vast. Maybe worth "10" on the stiffness rating. Love these boots. In the last two years I've been on the Scarpa Alien and Syborgs. These are heavier, but you can actually drive a 105mm ski with them. A real ski boot with a modest weight and a solid, non-gizmo locking cuff. Oh, and thanks for the quick shipping to AK. You guys run an amazing business. When I check the size charts for the TLT7 Exp and Perf it only brings up the size chart for the TLT5/6's. Everyone I've talked to says they have increased the volume in the shell from last year and the Exp. fits much differently than the Performance. 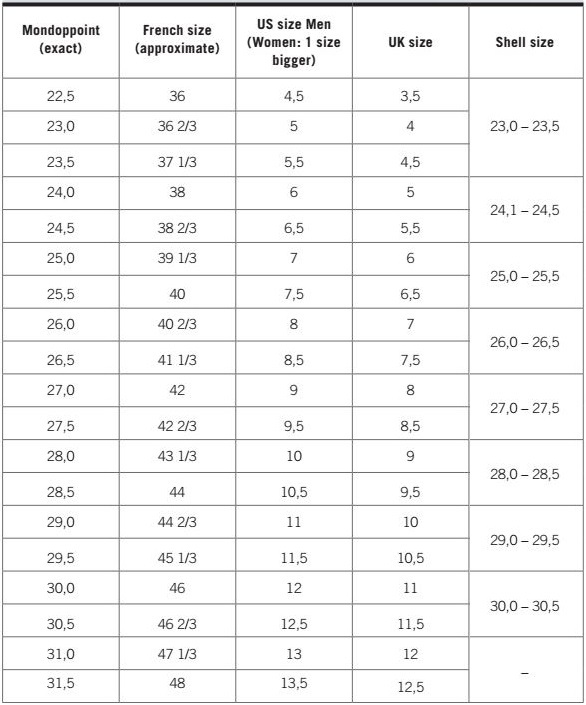 Do you have new size charts that reflect the changes for this years model boots? Hi Brad, the size chart hasn't changed but the subtleties have. I'd suggest using our Boot Fitter to find the right size for you. I've been having trouble finding reliable info about how the Expedition performs up against the Performance and Carbonio. Any input? We got the Expedition boot and the Carbonio boot already (waiting on the Performance version) but have already sold the comparable sizes in other versions so we've only gotten to try on a few boots here and there. Give it a week or two and we should be replenished and can give you a better answer once we have all been able to spend some time in each version. I can say definitely say one thing about the TLT7 across the board though, given my admittedly limited hands-on experience so far: They are rad. I like them a lot and unless someone else can toe the line with a better offering, this will set the bar pretty high for the 1kg boot category. Hi abp, only the Performance version was available for testing last spring, which is why there aren't any good comparisons yet. Note I've seen at least one review for the Carbonio version that was clearly made up (because it had not been available for demo prior to the July 2016 "review"), so be sure to check your sources.